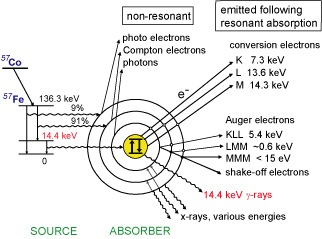 The nuclear decay scheme for 57Co → 57Fe and various backscattering processes for 57Fe that can follow resonant absorption of an incident gamma photon, modified from DeGrave et al. (2005) and Dyar et al. (2006). The Mössbauer effect is the recoilless emission of gamma rays from certain crystals discovered by Rudolf Mössbauer in 1957. When gamma rays are emitted from most nuclei, the latter recoil to a variable extent, giving the emitted photons a broad energy spectrum. Mössbauer found that certain crystals, e.g. Fe57, recoiled as a whole, i.e., their effective recoil was negligible. Gamma rays of closely specified frequency are thus produced and can be used for nuclear clocks and for testing relativity theory predictions.